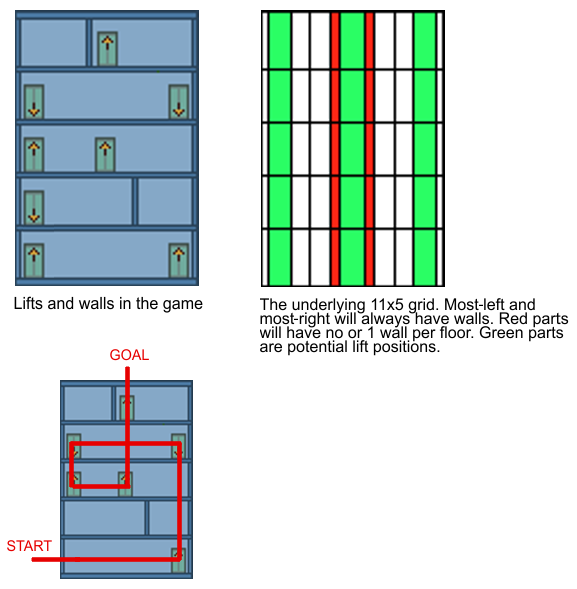 Ensure house map maze with lifts can be solved? My question: How can I ensure the map is always randomized yet always solvable and that the hero, starting at the left side of the bottom floor, can always leave it via any upwards-pointing lift at the top floor? For what it's worth I'm using the Lua language for development. Thanks so much! What you want to do is create a Graph such that every node is an elevator position, and the edges between them means you can walk/lift there. Once you made the graph you can use dfs/bfs to see if you can get from the start node to the end node. Using you example above I made a picture of how the graph would look like. Green circles means there is an elevator there, and the green lines means you can travel from node to node. The difference between what you have and a normal maze is simply that it has non-adjacent connections vertically. I think that what you should be looking at are graph-based maze generation algorithms. You simply need to have a larger set of "adjacent rooms" or "possible walls" than an ordinary 2D maze does, in that every vertically aligned pair of floor-grid-cells which does not already have an intervening lift is adjacent. You could model this as a graph where adding definite lift edges incidentally deletes other possible lift edges; some algorithms might be confused by this, but not others. Not the answer you're looking for? Browse other questions tagged 2d maze or ask your own question. Zelda LttP (Super Nintendo) room changes? How do I represent walls in a 2D tile based map? How to program an attack that I control with the arrow keys? How to resolve collision of two or more linearly moving non-rotating axis-aligned 2d boxes? How to allow to slide rectangle to not colliding with corners between two rectagles?